My name is Amanda, and I have been reselling clothing since 2008. I used to have a vintage store with my sister on Etsy (and blogged about vintage fashion, which is how I had the pleasure of meeting Alison! ), dabbled in eBay, and have been selling on Poshmark since 2016, but I have only grown to be a regular “full-time” seller in the last year. I also help Alison run her Poshmark closet! Because so many people are likely cleaning out closets right now–whether because it’s the new year or that Marie Kondo series on Netflix or maybe you’re impacted by the government shutdown and could use some extra cash–Alison thought it might be helpful to share a crash course on how to make money on Poshmark. Poshmark is combination reselling and social app. 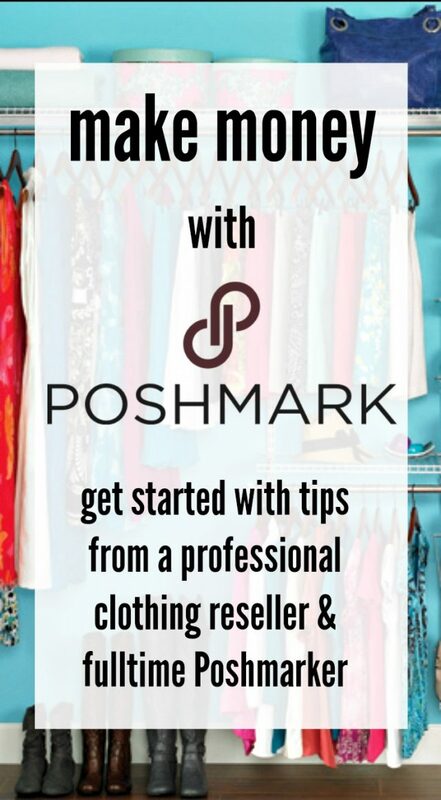 With Poshmark you can easily sell clothing, shoes, jewelry, and more right from your phone. You can follow people’s closets and know when they add new items. You also have a news feed where any important alerts appear, like sales, offers, or questions about your items. Unlike eBay, Poshmark is just for fashion, and unlike The RealReal, Poshmark is a great place to sell mall and big box brands and clothes in good condition that may be a few years old. While Poshmark may involve a little more work and participation than eBay or apps like Mercari, if you are selling fashion and someone who loves clothes, it’s absolutely worth it, in my opinion. It’s also incredibly convenient, considering you can operate entirely from your phone, which means that other than taking the item photos, you are able to do everything remotely. I listed items for sale from a beach chair at the pool this summer, from a table at my favorite coffee shop while sipping a latte, while watching my kids play at the local park. Poshmark is an app in which users have their own closets. You post items to your closet and can shop in other people’s closets. Your newest items will appear at the top of your closet when people scroll. 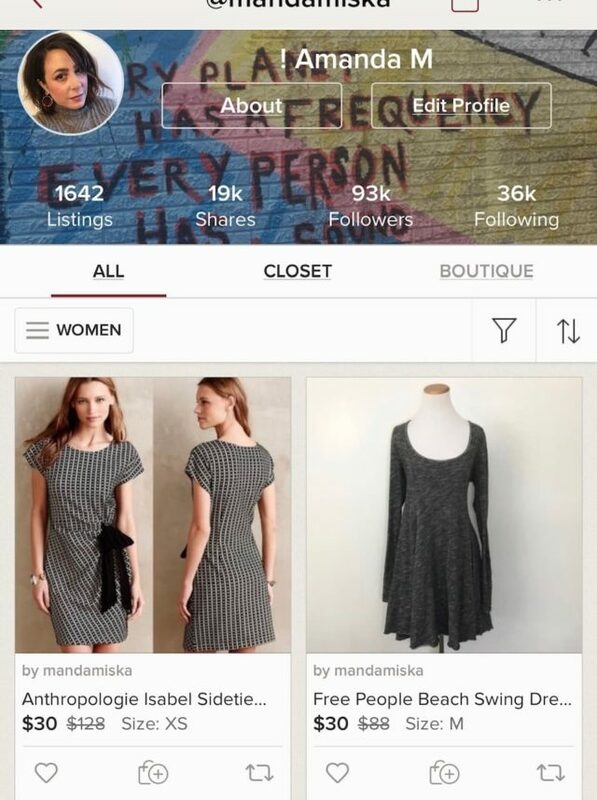 Poshmark has a feed of all the closets, and when you add new items, they will show up in the feed to your followers. There is also an extensive search, which is typically how people find items. Most buyers come to Poshmark looking for something specific, so describing your items clearly is important! Poshmark also has parties, where seasoned users curate showrooms based on different brands or themes. The app also has and showrooms where you can see what the current trends are. And then your seller page. This is where you have access to your closet, likes, purchases, profile, and tons of seller tools, as well as your stats. In terms of community, you follow people, and they follow you back. You can comment on items publicly to ask questions, and you respond to buyer questions publicly as well. Buyers must accept and rate their purchases before your money is dispersed into your account; however, only your average rating is displayed, not comments, which can be a relief to people who might have anxiety about shifty buyers (and there are always a few). The first thing you want to do is set up a profile. This includes creating a username–you can use a variation of your own name, but a memorable name for your closet is something I’d also recommend if reselling is something you might like to do regularly!–and fill out a size and brand profile that will reflect both what you might be selling or looking for as a buyer. 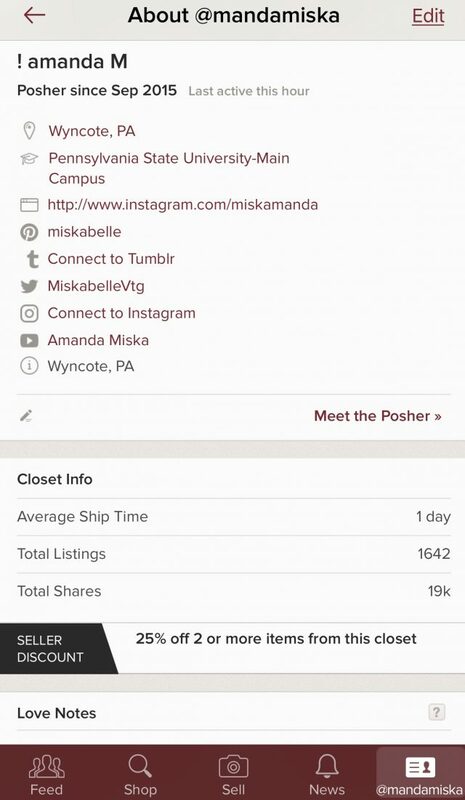 This information is what Poshmark uses to help curate your feed and help buyers find you and vice versa! You can choose to include information like your social media accounts, the university you attended, city you live in, brands you love, and more. A complete and detailed profile helps others find and connect with you on the app. And it’s also the place where potential buyers can see your stats and your love notes, which are optional notes people can leave for you when they have a really good experience buying from your closet. Poshmark recommends that sellers have at least 10 items in their closet to start. You also should share your closet daily, at least once, but preferably two or three times. This ensures items are seen in the feed and by potential buyers. When possible, post throughout the day rather than all at once. This keeps your closet fresh and keeps you appearing active on the app. No need to buy a fancy lighting kit, but you do need to take clear, well-lit photos in order to get the most attention on your items. There is no need for a mannequin (although I like using one, and you can buy them fairly cheap these days). You can hang your item on a blank wall. Just make sure you’re getting photos from various angles, and items are as wrinkle-free as possible. Try to take your photos in daylight near a window. And you can always use a photo editing app (there are so many good, free ones out there now!) to brighten them a bit (just don’t go overboard or the color or texture of your item might get misrepresented). Another important note: take a photo of the brand/size tag as well as the materials tag, if it’s there, so buyers can see exactly what they’re getting. Another photo hack, which is at times controversial, is to find a stock photo of the item and use this as your primary photo. You can often find them by googling the brand with a specific description of the item. However, you still need to take and present photos of the actual item for buyers. (see image below: on one side is an Anthropologie stock photo I was able to find since the item was more recent; the Free People dress I shot in front of a white wall with my mannequin). You don’t have to be an SEO pro to understand how to create a good title or description: you just have to think like a buyer, and also understand Poshmark’s focus, which is about brands and on-trend styles. If you wanted to buy the item you are trying to sell, what would you Google to find a photo of it? This is a good place to start. 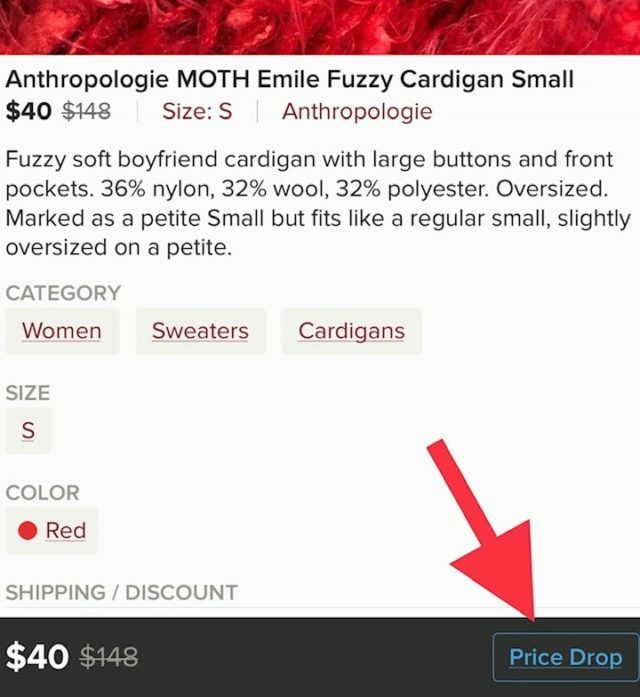 If you have room at the end of your description, you might also add the size (or just a S, M, L, XL) because Poshmark items very often show up in Google searches and people are likely looking for something in their size. In terms of descriptions, you also want to have good keywords that tell your buyer anything they’d need to know about an item. In your description, you want to include the type material, if there are any flaws with the item, and sometimes, if you are fashion-savvy, you might include a styling tip to beef up the description: “These heels would look great with a pair of ripped jeans and an oversized boyfriend blazer” or something along those lines. Measurements do come in handy for things like jeans, where the rise (crotch to top hem) and inseam (crotch down inner leg to bottom hem) and waist are important factors in fit. It doesn’t hurt to include other measurements as customers sometimes ask for them. 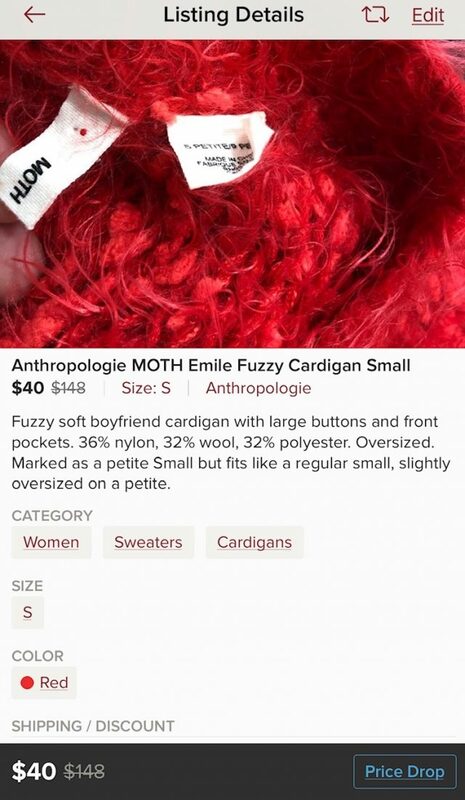 Above, an example of the title and description for a fuzzy red cardigan from Anthro that I posted just this week. One of the best ways to choose a selling price is on Poshmark! 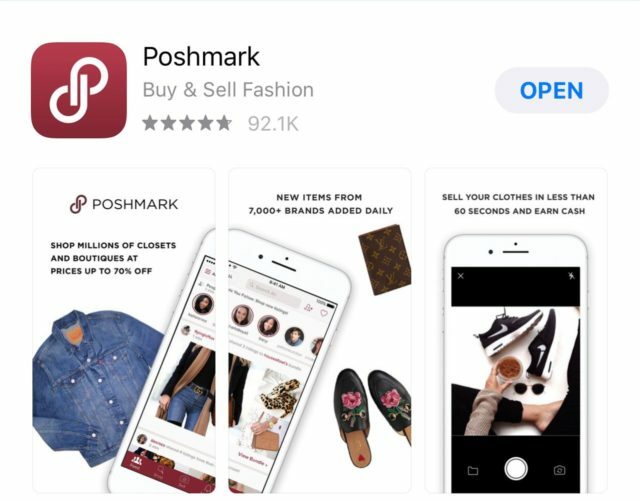 Search for the same item or a similar item on Poshmark and see what it has sold for on the app. You can do this by typing the brand and description of the item into the search bar, and in the advanced searching bar at the top, scroll to the far right, and under AVAILABILITY, select Sold Items. Sometimes, you might think an item is worth a lot, but like any consumer experience, supply and demand applies. A lower price is the way to compete in a saturated market. And if the average selling price was $25, you’re probably not going to get $50. A lot of buyers make offers on items. My suggestion is price at least 10-20% higher than what you would want for the item to account for this. Keep in mind that Poshmark’s cut is 20% of the selling price, or $2.95 on any sale under $15. You can also send offers to people who “like” your items, using the Offer to Likers button, but these offers must include a shipping discount and be at least 10% less than your set price. On this cardigan, if I hit Price Drop, I'll have two options. I can either drop the price overall, or just send a special Offer to Likers with the shipping discount. I might offer them $35 with discounted shipping. They can buy or they can even make a counteroffer. I love selling on Poshmark because they handle the most tedious and difficult part of reselling for me, which was shipping. Poshmark sends a mailing label directly to you, and buyers pay shipping. That’s it. No weighing, no measuring, no evaluating the best method. Everything ships priority at a flat rate, as long as it’s under 5 pounds. Have Fun Making Money with Poshmark! There are a lot more things happening on the app like parties and Poshmark ambassadors and Bundles. However, this is your quickstart guide to starting a closet. Another way to get comfortable is just to mess around on the app. Look at other people’s closets, check out the main page parties and showrooms, search a brand you love or own a lot of, and see what’s available. Have additional questions on how to make money on Poshmark? Ask in the comments! Also, please add Alison’s closet to shop some of your favorite pieces from the blog, and my closet for a wide range of styles and sizes (and even some menswear and kids, which you can also add to your closet! ), and I’ll add you back and share yours! If you join, use my code MANDAMISKA and get $5 off your first order, and I’ll get a little bonus for recruiting you: WIN-WIN! I have several pieces of teen boy clothing that I’d like to sell. Do I create a profile with his information (likes, measurements, etc) or mine? Also, if I list 20 items and someone buys 5, does the app realize that I can ship everything in a bundle and send 1 label? How does bundling items work? Thanks! Hi Susan! Great questions! Since you are the seller (and if you plan on buying things for you in the future), the profile is about you, but you can obviously sell more than just women’s clothes. And YES, as long as they truly bundle the items, they do just send one label. People bundle because they can get discounted shipping this way, but also, when you go into the app to SELLER TOOLS, there is an option called MY SELLER DISCOUNT, which is where you can set a percentage off if someone buys 2 or more items (or 3 or more, though I think 2 or more is more appealing). It can be as low as 10%. Also, when a buyer puts items in a bundle but doesn’t buy it right away, they probably are looking for you to make an offer, which is super easy if you just click on that bundle. I hope that’s helpful and answered your questions! How does Poshmark police their sellers? I have had the worst experience trying to BUY on their site. I would never recommend it for something you actually need. I tried to buy a cute wristlet and paid full price but never heard anything from the seller. After 10 days Poshmark emailed to say they could not reach the seller a d I was now able to request a refund (my card was charged even though nothing had been shipped) and in another week the refund was posted. But geez that was a lot of back and forth in the end for literally nothing (no wristlet). It sounds good for sellers but for buyers it’s pretty unreliable. Maybe my first experience was far outside the norm but the many hoops required to get a refund on an item that never shipped was ridiculous. I mean, if the seller is MIA after 10 days then maybe make the refund automatic. I am so sorry you had that experience. I’m not sure about the policing, but there are a few tricks to make sure a Poshmark seller is active. 1) at the top left corner of the listing, under their avatar/name, it will usually say when the item was last updated. If it’s more than 3 days, I wouldn’t buy; unless it’s something you really love and need at an amazing price then 2) you can comment on the item, with “Still available?” and wait for seller to respond. If they don’t then you know. I don’t love Posh’s policy about releasing funds–it isn’t great for sellers either, although they have shortened the waiting time recently from 7 days to 5 days before you can cancel an item if it hasn’t shipped. Great summary! Better than the one Poshmark offers. I would like to offer another tip: For pricing research, if you don’t find sold comps on Poshmark that match your item, you can search on sellhound.com to see whether there are comps on other platforms such as eBay or Mercari. oh, thank you! And i totally forgot about SELLHOUND, I heard about it and it slipped my mind! Thank you!! Absolutely! Let me know the name of your closet and I’ll share them to my feed if you’d like! Well this was right on time. I uploaded 10 items to my class a week or so ago, trying to get rid of all these handbags in my closet that don’t fit my life anymore but I wasn’t getting any interest. Thanks for the tips!